Solutions for Higher Education engages in deeper reflection of critical issues in the world of colleges and universities. In Episode 7, professors John Taylor and Matt Nickerson join President Scott L Wyatt and Professor Steve Meredith to discuss the approach to Southern Utah University’s Jumpstart General Education Program. Assistant Vice President for Student Affairs, Dr. Eric Kirby, was one of five presenters selected nationwide to present at the annual EAB ConnectED Conference. The event, held in Washington D.C., showcases top leaders in higher education through a Ted Talk style presentation. The conference hosted over 500 administrators from around the country. In the last two decades, superheroes have taken over not only American theaters but screens across the world. Southern Utah University President Scott L Wyatt joined hundreds of high school students at Cedar High School in early December to discuss the advantages of attending college. Wyatt stressed that the decisions students make now determine the life they will lead. Solutions for Higher Education engages in deeper reflection of critical issues in the world of colleges and universities. In Episode 6, President Scott L Wyatt and Professor Steve Meredith discuss the importance of General Education requirements at universities and the goal of developing engaged citizens. Dr. Richard Saunders serves as the Dean of Library Services at Southern Utah University. His passion for education, history and books started from an early age. Create a cozy fringed plaid flannel blanket or scarf with minimal work. Create easy planters in a variety of shapes and sizes for simple, beautiful gifts. Presents made with love are the best kind. Make these DIY handmade gifts to give friends and family this holiday season. Follow these easy DIY steps to create some fantastic, last-minute, and affordable gifts! With this process, you can create simple custom designs on t-shirts, pillowcases, tote bags, or anything made out of fabric. As an engineering major at Southern Utah University, Jacob Carter has had multiple opportunities to directly apply his education to real-world experiences. From working with businesses to presenting his research at statewide conferences, Carter utilizes his skills in engineering, project management and communication to effectively solve problems. Ornaments by local Utah student artists will dazzle President’s Park (White House) in Washington, D.C. as part of the 95th annual National Christmas Tree Lighting display. 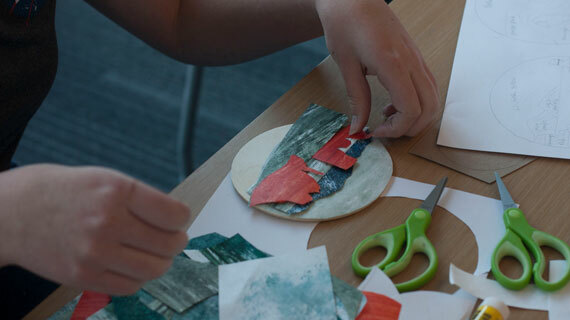 Middle and high school students from Cedar City designed ornaments that showcase the unique and beautiful landscape of southern Utah through collage. Wherever her career takes her, Kali McKenzie simply has to spend time in the outdoors. As a Wilderness Ranger for Zion National Park, she gets plenty of opportunities to do just that. It is my pleasure to announce Southern Utah University has hired its first Chief Diversity Officer; her name is Dr. Schvalla Rivera. Dr. Rivera comes to us with a wide range of experience working with students, faculty, and staff. A separate press release will be sent out introducing her to you. She will begin working with us next month and will report to me as a member of the President’s Council. A good education makes economic sense. College graduates on average make more money than people with only a high school diploma. They also experience lower levels of unemployment. These are great reasons to go to college but it can be difficult to pay for college with personal finances. Many students turn to loans in order to make ends meet and run the risk of making huge financial mistakes. President Trump traveled to Utah today to announce a historical reduction of federally protected lands in Utah. Two proclamations were signed, reducing and restructuring both Grand Staircase Escalante and Bears Ears National Monuments. After an extensive search, Mary Pearson has been chosen out of a very competitive national field to serve as the Dean of the School of Business at Southern Utah University. Following a month-long open-house which welcomed nearly 200,000 people for a walk-through of the new structure, the Cedar City temple, built by the Church of Jesus Christ of Latter-day Saints (LDS), will be ready for religious services after a Cultural Celebration and official dedication on December 10, 2017. Solutions for Higher Education engages in deeper reflection of critical issues in the world of colleges and universities. In Episode 5, President Scott L Wyatt and Professor Steve Meredith discuss the cost of tuition and why it’s risen in the United States. When Harley Glad started at Southern Utah University, she had no idea what she wanted to do or be. Her only goal was to get her associate’s degree and hopefully find her passion along the way. Through a series of events and taking the career coaching class through the Career Center, she narrowed down her academic interests to engineering.